Even though Tableau is constantly expanding its capability with maps and maps data, sometimes it takes a few extra steps to get to the geographic data you need. 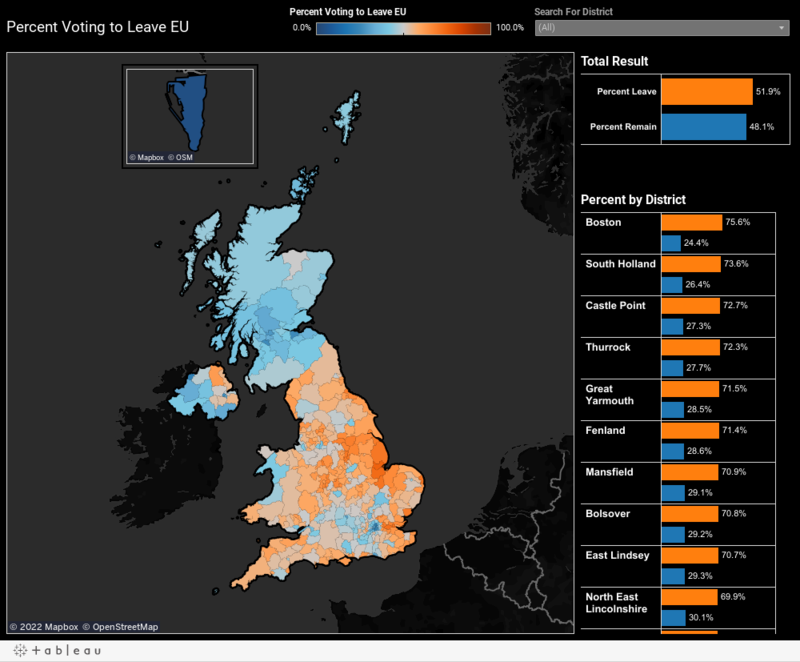 In the wake of the Brexit vote, many of us here at Tableau were interested in exploring the raw JSON data that was generated showing voting results by wards/electoral divisions and Parliament constituencies. I'm not wanting to blow my own trumpet here, but there is an easier way to get a tableau-readable set of geographic data if you have the shapefiles already loaded into a postGIS database. You've got all the tools you need within there to get the data formatted in such a way for tableau, without needing to export the data into R or anywhere else. This may be a simpler solution, particularly if your shapefiles are all held on a central server that you can connect to in the normal manner. I've documented the process here: https://community.tableau.com/message/493700 or on GIS.Stackexchange. Great geospatial visualization! This perfectly demonstrates Tableau's versatility. From analytical point of view it would be great to add number of votes beyond percentages - with a toggle - to see absolute numbers. Very cool. Tableau and the data.